Morgan City Rentals offers an assortment of various sizes and lengths of pipe slings with storage racks designed for the transportation of tubular products. Pipe slings (3/4", 1") and pipe sling racks for pre-slinging tubular items for offshore shipping. 25' and 30' slings, load test certified. 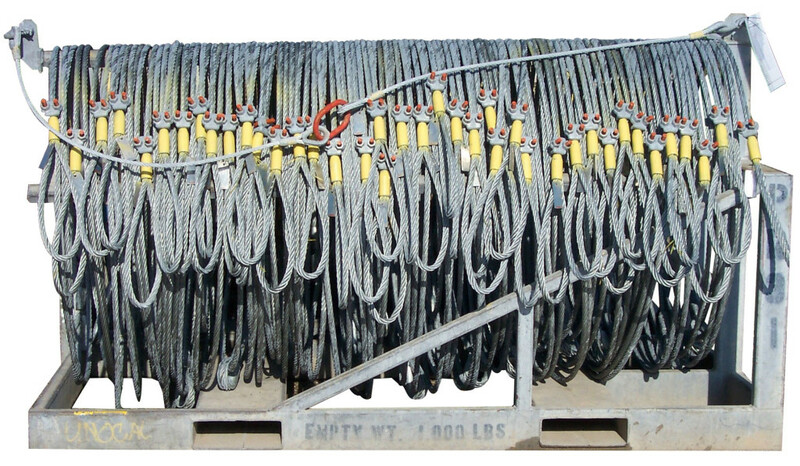 All wire rope slings will be designed and manufactured to handle applied loads and verified by pre-use inspections. Check dates on sling tags if jobs are being delayed or stored in yards for an extended period of time to mitigate any possible out of date slings. Galvanize storage racks to neatly store and secure pipe slings while not in use. 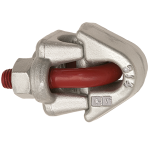 Pipe slings are equipped with a Crosby G461 Bundle Clip. The Bundle Clip is utilized in a choker hitch application to maintain the shape of bundled packages after a load is placed. The Bundle Clip is attached to live line of choker hitch, but it is never to be used as a button or ferrule to carry a load in the primary load path. Proper Configuration of Pipe Slings - Click here.